Tricia Vanderhoof of Gannett News really knows her stuff. I love a good interview. Read all about it here. Ace Atkins spent his 48th birthday on June 28 in Alabama, visiting his mother. Alabama is where he first gained national fame, gracing the cover of Sports Illustrated for Auburn University’s football team’s perfect 1993 season. A quarter of a century later, it’s also where he headlined the Alabama Book Festival this year in Montgomery the capital. His newest book, “The Sinners,” the eighth book in Atkins’ Quinn Colson series, will be published on July 17 by G. P. Putnam’s Sons. In May, Putnam’s also published “Robert B. Parker’s Old Black Magic,” the latest in the Spenser series; Atkins was chosen by Parker’s estate to take over the Spenser series in 2011. Following is an edited version of a recent conversation conducted on Atkins’ birthday about his life and writing. Question: Football a religion in Alabama, your dad was a professional player, coach, and scouted for the NFL. You and your family – including three dogs and four cats — now live on an historic farm outside Oxford, Mississippi. You’ve said you had to move there to become a writer because in Alabama, you’ll always be a former football player. Is that still true? Ace Atkins:Fans are for either University of Alabama or Auburn. It’s such a big thing — even restaurants here are divided according to who you root for. But there’s also a very strong long literary tradition. We have a terrific internationally-known bookstore, Square Books in Oxford (Mississippi). It’s a little more diverse; people really celebrate musicians, writers and artists. Question: You always loved books and were a voracious reader. A coach once took a book out of your hand? Ace Atkins: I had a coach who thought reading any kind of fiction was a waste of time. He told me that the only books worth reading were the Bible and books by Pat Robertson, the TV evangelist. Question: You tried to take a creative writing class at Auburn but weren’t accepted. Do you still believe it was because you were a football player? Ace Atkins: It is a true story but I don’t think it was because of football. Back then I thought I could disguise myself by not wearing any ballplayer gear, like my leather jacket, although I don’t know that anyone ever took me for a regular student, or a frat guy – I was pretty sizable. I think it was just a teacher who was overwhelmed and just didn’t have a space for me. I remember very clearly. Never saw the teacher before or since, but she asked, ‘Has anyone here tried to write fiction?’ I quickly raised my hand. I had tried writing short stories and was very into fiction. But even with that, I think she just thought, ‘I don’t have time to grade any more papers.’ It stuck in my mind, though – I was a little bit annoyed. However, I recently gave a talk at the university and was asked what I remember about Auburn. I remember teachers who were very, very good to me there. Marian Carcache – her expertise is Southern literature, especially Flannery O’Connor. She didn’t care about the football, or who I was, she just loved what she was talking about. It made a huge impact on me. She’s still there. You remember people like that. She was one. There was also a guy name George Plasketes who taught writing for film, movies, and television. I took two classes and really bonded with him. And – it’s so funny – I found out that he also had played football, for University of Mississippi, so we had a lot in common. We’re still in touch. Question:What skills as a football player have translated to your writing? Ace Atkins: I used to laugh about it when I was younger, hearing the cliché about how you’ll use these skills later in life… how often does a middle-aged guy have to tackle somebody, or drop into a pass pattern? But what I’ve taken away from that: practice, practice, practice. For me, it’s reading as many books as I can, writing as much as I can, trying to improve. All those things I learned from football. Question:So you’re telling me that verbal abuse in the locker room prepared you for the newsroom? Ace Atkins: If you can take criticism, it’s writer boot-camp. And also working all the time. You finish a book, you examine it to see ‘What did I do right? What did I do wrong?’ Not getting cocky about it but always looking to see how I can improve. The newsroom was just huge for me. I couldn’t have asked for a better background. I loved those years at the papers. It was the best decision I ever made in my life. Question:It taught you perseverance that’s required for both? Ace Atkins: I think so. I’ve been writing fiction for almost 20 years and I’ve seen a lot of people come and go. Some come in and think they’ve published that one book and have it made. But it’s a crazy, tough business. Unless you’ve written ‘To Kill a Mockingbird’ or ‘Catcher in the Rye,’ you really can’t retire. You’ve got to keep on moving, thinking about the next thing. Question: Anything you learned that’s completely useless? Ace Atkins: For an internship at Auburn, I spent about five months out in Los Angeles when I was 23 trying to possibly work as a screenwriter. What I did learn from that is that I did not want to ever work in the movie business. I saw how movies were made and said, ‘This is not for me. I want to be a legitimate writer.’ And that led me to working for the papers. Question:A hallmark of all your novels is sense of humor. Do you find humor in different things than you normally might when switching between Confederate (Quinn Colson/Mississippi) and Yankee (Spenser/Boston) sensibilities? Ace Atkins: Absolutely. Part of that is because my dad worked for the NFL and was a professional football coach. I was born in the deep South, have family and strong roots there, but as a kid, we moved to different corners of the U.S. I’ve always been very sensitive to cultural norms and social changes, different ways of speech. As a child, that was a way I would hopefully fit in. And I’ve always been fascinated by those differences. I love to eavesdrop, listen to the ways people talk. I’ll hear people say things you’d only hear in Boston. To maybe overly generalize, I think in Boston, the northeast in general – they’ll just tell you exactly how things are, exactly the way they feel, or the way they feel about you. I find it refreshing, they break down barriers really quickly. Northerners tend to be much more direct. Southerners… they will tell you everything but, go all the way around to get to the point. In fact in the South, something might be considered an insult whereas in Boston, it could be an act of friendship. Up north, someone can say ‘eff-you’ and give you a hug. Down here, somebody might pull a gun. Ace Atkins: I may have. I spent time with Myles Connor, a very famous art thief. He may well have mentioned it as a mark of professionalism. The antennas are definitely always up when I’m in Boston; I file these nuggets away for later Spenser use. Question: You have marvelous quote in ‘Old Black Magic’: ‘Live your life, do your work, then take your hat.’ It’s from Henry David Thoreau’s poem, “Conscience.’ Is Thoreau a particular favorite of yours? Ace Atkins: Getting back to reading Thoreau has a lot to do with Robert Parker. Parker was a big Thoreau fan and often quoted him. He also liked Robert Frost a great deal. Those two famous New Englanders were the fabric of the Spenser canon, very much part of what I think makes Spenser, Spenser. So it’s very important to me to commune with those writers – a lot – any time I’m writing a Spenser book. Question:There’s an irony here. How did you, a good ‘ol Southern boy, come to be chosen to carry on the Spenser series? 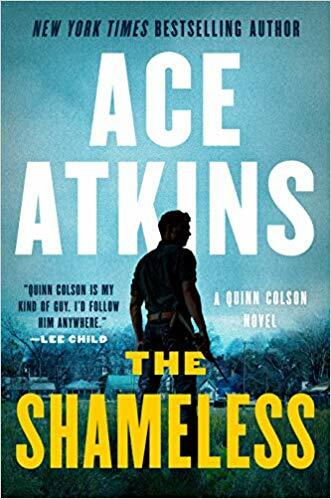 Ace Atkins: I had been at Putnam for about five years and just created the Quinn Colson series – a guy who’s a sheriff in a Southern town. The president of Putnam, Ivan Held, who would have just read that book, asked if I’d like to submit a few pages. Around Christmas of 2010, Chris Pepe, Mr. Parker’s longtime editor, called to notify me that I’d been chosen to continue writing the Spenser books. The pages I submitted were unanimously selected by her, Parker’s agent Helen Brann, and Parker’s widow Joan. I think that even though I’m from the deep South, they saw something in my work that very much came from the same influence as Robert B. Parker: classic westerns, classic crime novels, Dashiell Hammett, Raymond Chandler, the movie ‘Shane’ — that type of storytelling. It was incumbent upon me to come to Boston to really get a feel for the location. That goes back to my newspaper training, something I was able to pick up very quickly. But the harder thing was getting a feel of what these characters are all about in the type of stories Parker wanted to tell. American archetypes in the same tradition of hard-boiled fiction and westerns influenced the kind of books Parker wanted to write in the same way they influenced mine. Question:How old is Spenser now? Ace Atkins: Aaaah, the question we never address. Bob Parker kept Spenser for 15 to 20 years in a kind of suspended animation, never beyond early- or mid-50s. But in 2022-23, we’ll be coming up on 50 years of publishing Spenser. My first Spenser book (‘Lullaby’) was to keep continuity, and to honor Parker’s legacy. We didn’t know whether it would be successful. But my only instruction from Parker’s estate was to keep the character contemporary. Now I’ll be working on the eighth. I brought Spenser into modern times: he has a cell phone, he texts, he uses Google. But I’ve set the clock ticking again, he’s getting older. He’s seen it all, been around Boston a long time. I’m allowing him to become the aging gunfighter — but everyone he used to fight against is either dead or retired, and he is still fighting the good fight. I like the idea that he’s not quite as fast or as good as he used to be and there’s a younger generation of hoods coming up. Question: Have you noticed a striking physical resemblance between the older Tom Selleck and Parker? Ace Atkins: A similar look for sure. Especially the (Jesse) Stone character. And the older Selleck gets, the greater the resemblance. Question:What are some of your sources for the southern-language tidbits that pepper the dialog? Ace Atkins: I keep my ears open, I eavesdrop around the town square. And Walmart. I write ‘em down, use them later. Question: Ex-Ranger Colson has done 13 tours in Afghanistan. One of the things I love about Colson is that he’s a regular guy. Was that inspired by soldiers you saw returning from Iraq and Afghanistan? Ace Atkins: It was. I got really tired of super-soldier, Jason Bourne-type-portrayals. I’ve met a lot of people like Quinn Colson, not superheroes but average Joes who have seen a lot of action after 9/11. I wanted to write a book about them. Some work at Home Depot, law enforcement, mall security. Colson was away for 10 years and has come back to a different world. It’s something soldiers can certainly understand. And that’s what I was trying to write. Question: And Quinn is a southern version of the iconic old-west gunfighter? Ace Atkins: He is. Kind of like what Parker did for the northeast. They’re sorely missed in modern society. Subscribe now to get everything you need to know about local news, education, politics, things to do, restaurants and more. Download our apps by searching for MyCentralJersey in your app store or use these links from your device: iPhone app | Android app for phone and tablet | iPad app Don’t forget to ‘like’ us on Facebook!